a fan of the new Cookin' At Café D Facebook Page! RSS and Google Friend Connect using the buttons to the right. Basically, whether you like your updates on whole wheat, Greek toast or rye...we've got you covered! So, last night I mentioned to some folks that I had a pot of onions caramelizing - making the whole place smell all warm and sweet. I'll let you in on what I was making. Right now it's my favorite sammy. 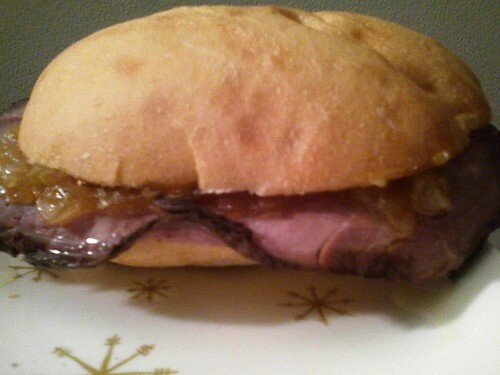 A roast beef sandwich with caramelized onions and Boursin cheese. Anyway, I toss a handful of onions in a pot with some butter and let 'em simmer for an hour or so. Grab some Brousin and smear it thickly on some French bread. Pile some rare ruast beef, and pile on the sweet caramelized onions. I've never caramelized onions--shameful I know! Yesterday I made a Buffalo Chicken Pita recipe that called for caramelized onions. I was afraid I'd just burn them so I left them out. I'm sure the pitas would have been so much better had I included them. And the Boursin cheese--I've seen that stuff but never tried it. I'm going to pick up a container and try it out. You've sold me!